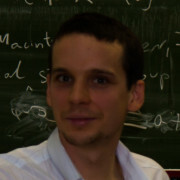 J. Dobrowolski, K. Krupiński, On omega-categorical, generically stable groups, Journal of Symbolic Logic (77), 1047-1056, 2012. J. Dobrowolski, K. Krupiński, On omega-categorical, generically stable groups and rings, Annals of Pure and Applied Logic (164), 802-812, 2013. J. Dobrowolski, New examples of small Polish structures pdf, Journal of Symbolic Logic (78), 969-976, 2013. J. Dobrowolski, K. Krupiński, Locally finite profinite rings, Journal of Algebra, (401), 161-178, 2014. J. Dobrowolski, Topologies induced by group actions, Topology and its Applications (189), 136–146, 2015. J. Dobrowolski, H. Kim, A preservation theorem for theories without the tree property of the first kind , Mathematical Logic Quarterly (63), 536–543, 2017. J. Dobrowolski, B. Kim, J. Lee, The Lascar groups and the 1st homology groups in model theory , Annals of Pure and Applied Logic (168), 2129-2151, 2017. J. Dobrowolski, Generic variations and NTP$_1$, Archive for Mathematical Logic 57, 861–871, 2018. J. Dobrowolski, F-V. Kuhlmann, Valuation theory, generalized IFS attractors and fractals, Archiv der Mathematik 111, 287–297, 2018. J. Dobrowolski, B. Kim, N. Ramsey, 3-amalgamation in NSOP1 theories pdf, preprint, 2018.